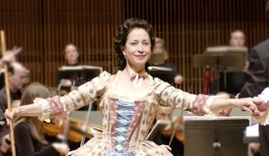 Glenda Norcross | The New York Baroque Dance Co.
Glenda Cearley Norcross has been dancing with the New York Baroque Dance Company since 2000, performing throughout the United States and in Europe. Her repertoir includes a wide variety of roles, ranging from the noble to the comedic, to the tragic. She has appeared in those roles with the Dallas Bach Society, Opera Lafayette, Mercury Baroque, Ars Lyrica, Concert Royal, The Dallas Opera, and the Baroque Philharmonia Orchestra. In 2006 and 2007, she and her partner performed in chamber music concerts in Florida, Georgia, and North Carolina with cellists Lynn Harrell and Christopher Rex. Ms. Norcross began studying classical ballet at a very young age with Eugene Bandzevicus. Her training eventually included other dance forms such as jazz, character, modern, and belly dancing. she competed throughout the Southwest as a baton twirler for many years and was the featured twirler for her high school band. At age 16, she decided to focus on a career in classical ballet and moved to Dallas to study with Prima Ballerina, Nathalie Krassovska. Under her tutelage, Ms Norcross received intensive coaching in the romantic and classical styles of ballet. She performed in numerous ballets under Krassovska’s direction, including, Pas de Quatre, Les Sylphedes and Giselle. She was chosen as Krassovska’s successor in the role of the Dying Swan, which she has performed many times. In 1997, She performed the Dying Swan for the anniversary gala celebrating the founding of the Russian Ballet Society in Edinburgh, Scotland. Ms Norcross also studied with the brilliant teacher and technician, William Martin- Viscount, at the Southwest Ballet Center in Ft. Worth. She has performed in classical ballet roles with The Lubbock Civic Ballet, Krassovska Ballet Jeunesse, Dallas Ballet, Ft. Worth City Ballet, Tulsa Ballet Theatre and others. She holds a B.S. in Dance, from Texas Woman’s University, where she also taught ballet for eight years. She served on the faculty of The Dallas Ballet Academy and the Booker T. Washington High School for the Performing and Visual Arts. Ms Norcross has also modeled for print and video advertising and is currently on faculty at Brookhaven College. She lives in Dallas with he husband and two cats.